The “Today Show” studio will be getting a new look come fall while still maintaining the same windowed studio space overlooking New York City’s Rockefeller Plaza. “The most pressing project is a renovation of Rockefeller Center’s Studio 1A, the home of the show’s street-level set since 1994. It has not been redesigned since 2006. In August the show will move to a temporary summer set on Rockefeller Plaza, as it did in ’06, for construction of the new set, which will make its debut in early fall,” the network announced. NBC News announced that Joe Michaels, who has been with the show for 18 years, has been promoted to senior director, and will be responsible for overseeing the installation of the new set. The network is also planning an overhaul of the show’s on air graphical look. 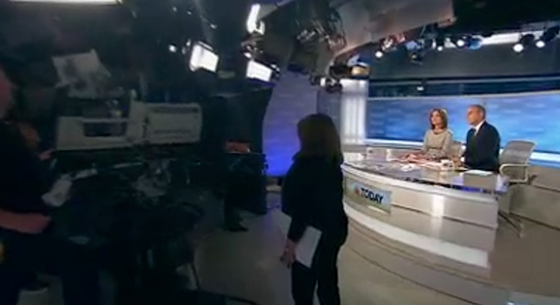 The show has used the current set since 2006, though some modifications have been made over the years, including moving to a larger anchor desk that, at the same time, eliminated the separate news desk, in February. “Today” also redesigned its graphics package earlier this year. Last August, during the network’s London Olympics coverage, NBC updated the exterior elevations of Studio 1A to allow for large video panels to be installed.